Which one Pokemon Would Win in Battle? (Explain why that Pokemon would win in battle) Also, Which one Pokemon is Better(high) Stats, Better attack moves, Better defense moves, Wider moves and advantage Battle strategy? Regardless disadvantage types and better battle experience. Some Pokemon would definitely beat disadvantage type Pokemon. Like Poliwrath would disadvantage electric attacks but it is strong enough handle durable electric attacks and then defeated Pikachu. So guys, any idea any Pokemon would regardless disadvantage types moves especially in the battle? Keep in the mind: My question is, Use Base form Charizard to against Serperior. Can Base form Charizard definitely Serperior? 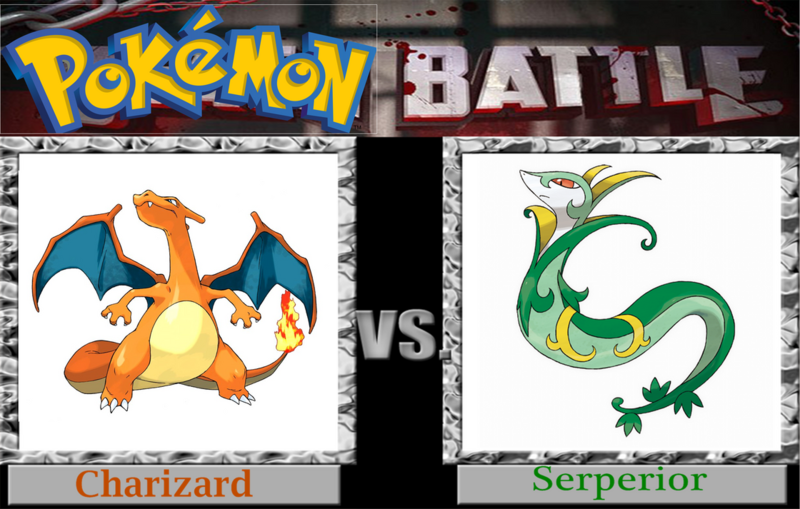 I am not sure base form Charizard may win against Serperior. I do not say use Mega evolution Charizard to Against Serperior! Mega Charizard most likely defeat any base form Pokemon. Serperior may disadvantage against Charizard or known as Fire and Flying type Pokemon but Regardless in the battle. If we're speaking strictly in terms of the game's mechanics, then this is fine because it can be tested. But it can only be allowed under that condition. This is not the place to arbitrarily create a real-life scenario and hypothesise over which mythical creature would win. To be perfectly clear, threads here should deal in facts and objectivity, and should promote knowledge and expertise. In a scenario where you can invalidate someone's point by saying 'what if it jumped above? ', you've achieved none of the above. Keep this thread tame guys. I will remove it if it devolves any further into mess than it has already. Some people write that as shorthand for "Charizard". Stop trying to speculate and do an actual turn-for-turn battle simulation to determine the winner. For this answer, I'll use these two movesets. Tell me if you think there's a different moveset that's better and I should use. These are what their stats come out to be. Whoever was controlling Serperior won the battle! So given those two movesets, Serperior will usually win because it's faster. I just want to tell you, anime and game isn't same. Don't think a pokemon can beat other easily. An Arceus can lose to FEAR strategy, A 100 Level Huge Power Diggersby can defeat many pokemon. IF you are a moon you would lose every battle regardless of your pokemon's stats. In the anime, a highly trained pikachu lost to a level 5 Snivy. Anime is illogiiiiiiiiicaaaal. Hold on. Pikachu loses electric power because Zekrom took his energy and Pikachu cannot use electric attack to hit level five snivy. After Zekrom reappear, Pikachu gained power back. Have you watched pokemon BW episode 3? I watched. If you know how to play the pokemon games, then you will understand some Iron tail and quick attack was enough to KO a level 5 Snivy. Yeah but I am not sure Pikachu's speed to reach hit snivy. Since Zekrom took Pikachu's power. Why would that win in battle: Well, Charizard can learn Focus blast, fire blast, roost and dragon dance while Serperior can learn leaf storm, glare. Serperior has good speed, but it has low offensive stats. If you're using contrary on Serperior, then you can raise SpA so easily. But it has very bad movepool, weak to common type and isn't much bully. So go with Charizard. Normal Charizard was very good in Gen 1-5, but it started sucking on gen 6. Very weak to SR, so you need Defog. But it has amazing movepool and offensive stats. Charizad has a better offensive movepool. Glare, toxic and many other move. Charizard has more wider, amazing movepool. Charizard can easily gain coverage against Rock, water/electric type move using HP grass or Solar beam/Earthquake. Serperior can gain coverage using HA rock, but Serperior can't hit much. Well, Surely, Charizard can easily KO Serperior using it's STAB moves. 0 SpA means the attacker has no special attack EVs. Charizard means the attacker was a Charizard. Blast Burn means the attack was blast burn. 0 HP / 0 SpD means the defender had no HP or special defense EVs. Serperior means the defender was a Serperior. 362-428 means the attack can deal any amount of damage between 362 and 428. 124.3 - 147% means the defender can lost any fraction of its HP between 124.3% and 147%. guaranteed OHKO means the attack will always OHKO the defender given these conditions. Serperior means the attacker was a Serperior. Frenzy Plant means the attack was frenzy plant. Charizard means the defender was a Charizard. 36-43 means the attack can deal any amount of damage between 36 and 43. 11.2 - 13.3% means the defender can lost any fraction of its HP between 11.2% and 13.3%. possible 6HKO means that the attack must hit at least 6 times to make the defender faint. after hail damage means that the attack may need to hit more times to make the defender faint if there was no hail. OHKO means once strike attack to knock out instantly? It means "one hit knock out". oh, guaranteed one hit knock out? what is the defender had no HP or special defense EVs? This should be pretty basic knowledge, but I'm going to explain it anyways. Every Pokemon has a max HP. When a Pokemon gets healed, its remaining HP is set to its max HP. When a Pokemon's remaining HP reaches 0, it faints. Attacks decrease the target's remaining HP, so most Pokemon battlers will try to attack a Pokemon if they want it to faint. The damage calculator calculates how much damage an attack does and how many times the attack can be used to make a Pokemon faint. First: MEGA CHARIZARD WILL NOT DEFEAT MOST BASE FORM POKEMON. There's at least a good 100 Base Form Pokemon that can destroy Charizard. So let me give something to go off of. With this Serperior has a 79% chance of winning. Charizard would have a 90% chance of winning with the item. No, sometimes Serperior will win, sometimes Charizard will win, so Charizard won't always win. A choice scarf Charizard or a solar power focus sash Charizard can't one-shot Serperior. If it's holding a choice scarf, then the Serperior will still get to move and one-shot the Charizard. If it's holding a focus sash, then neither will be able to one-shot the other, and both of their attacks have recharge turns, so the winner would be whoever was smart enough to use leaf storm or fire blast instead of frenzy plant or blast burn. Scarfed Charizard's speed is 448(448.5) while non scarfed Serperior's speed is 325 (both with 252 speed Evs). Did you make sure you were ignoring the type chart? He never said to ignore it entirely, he asked that despite having disadvantages, could either or win. I went specifically in the games mechanics to explain it. Sorry if I offended you or anything. No, I just though we were supposed to ignore the type chart. Is Charizard defensively weak against Ice in Gen. 1 (R/B/Y)? How do I breed Iron Tail on a Serperior? Is Serperior a good Pokemon to use? Worth having a rash dozing off serperior? What is a good moveset for Serperior?